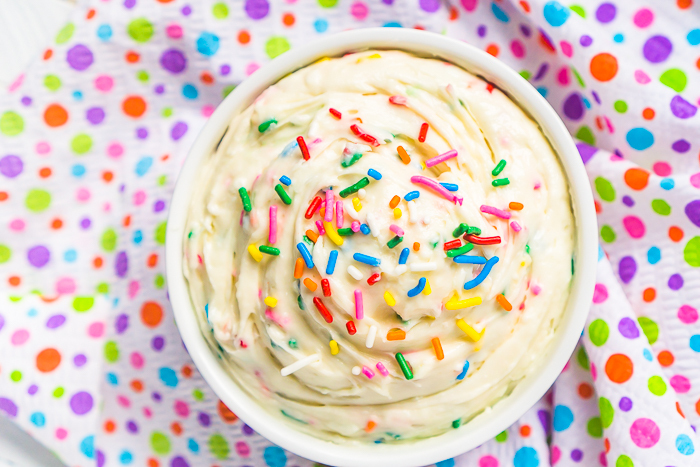 Enjoy your birthday cake in a new way with this delicious Funfetti Cheesecake Dip! 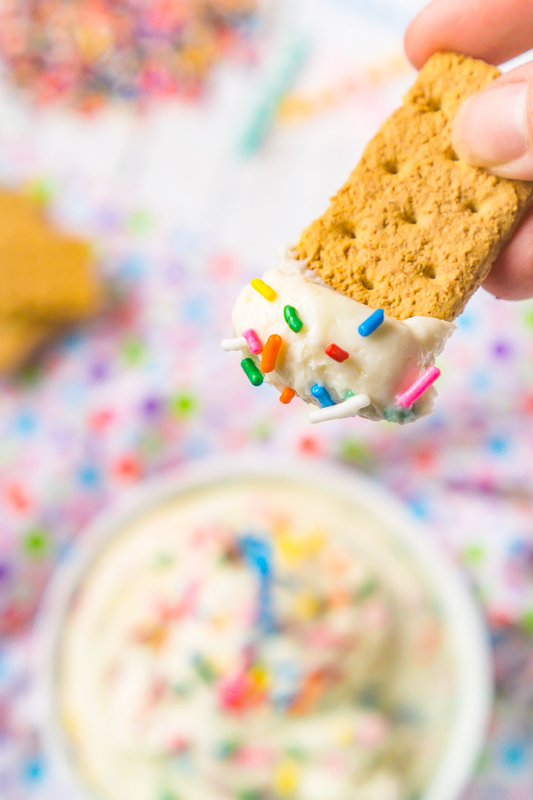 Sweet and creamy, this easy funfetti cake batter dip is absolutely addicting and makes the perfect addition to any party menu! The Best Birthday Cake Cheesecake Dip with Graham Crackers! Today is my birthday, which means we are officially at the beginning of birthday week! My husband and I were born only 5 days apart, with a couple friends’ birthdays in between, too. I decided to go all out this year with a week full of birthday recipes, which I started by remaking this Funfetti Cheesecake Dip. It’s been my favorite dessert dip for years! My day will always start with a “I’m happy you were born!” It’s what my husband always says for someone’s birthday. At first, I thought it was a little strange. I mean, what happened to the traditional “Happy Birthday”. Now, I love it! He is truly sincere when he says it! Do you have a weird birthday tradition or quirk? But let’s get to this Funfetti Cheesecake Dip! I’ve made a few easy cheesecake dip recipes over the years, including a Caramel Cheesecake Dip that is amazing with apples and a Snickers Cheesecake Dip that’s always a crowd favorite. This is my favorite though! While not a fan of birthday cake, the funfetti cake mix adds the perfect sweetness and flavor to the cream cheese base. I will be honest with you all; I thought about making this dip a bit healthier by using plain yogurt. However, as a huge cheesecake fan, I just couldn’t give up the rich creamy flavor that cream cheese and sour cream give to this dessert dip. It’s so delicious! Plus, it really doesn’t get much better than a no bake cheesecake dip if you are looking for a easy dessert recipe. Quickly whip all the ingredients together with a hand mixer or KitchenAid, except for the sprinkles which you’ll want to fold into the batter. Eating this cheesecake dip with Graham Crackers is my favorite but it’s also great with animal crackers and pretzel sticks. 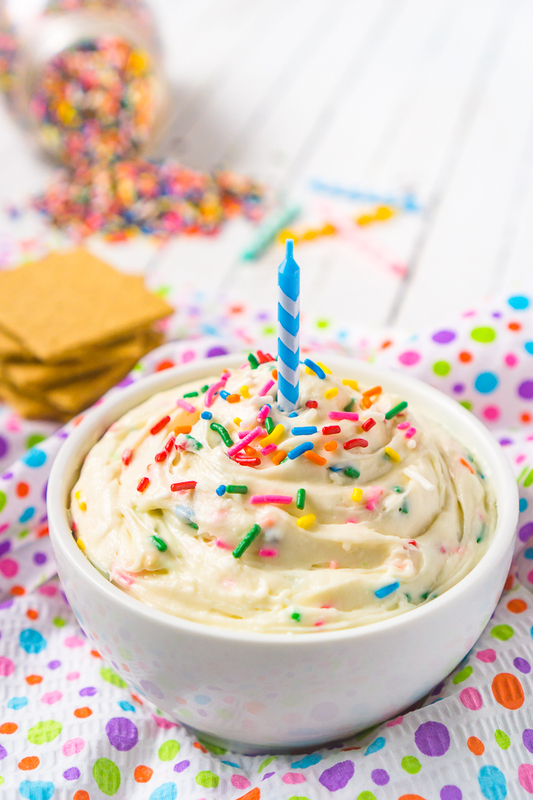 Time to Celebrate with this Funfetti No Bake Cheesecake Dip Recipe! This seriously looks incredible! I might have to make it this weekend. Thanks for sharing on the weekend re-Treat link party. Hope you link up to the party again tomorrow! Now that’s what I call yummy! Cheesecake dip! wow! I could feel my sweet tooth working! yummy recipe! And Happy Birthday to your Hubby! This looks so fun! I think you could totally customize it for any party with colored sprinkles or even the shape ones!! oh how fun! 3 of my kids have birthdays next month they would love this! I am totally making this for our next get together! My kids would eat this up. Okay, maybe I would eat this up, seeing as how I love cheesecake! What a great idea – I’m dying to taste it! This looks really yummy! I love a simple, tasty dip. My kids would go crazy for this. Found it on The Weekend Re-Treat! I could use this with my nieces and nephews because it’s definitely a recipe they can help make. Then we could have a little party! I think this is the best idea! Thanks for sharing, will be making it! Birthdays in may, do you deliver? I’m horrible in the kitchen so either dad makes a cake for the kids or we buy something. That looks really yummy. I would probably spread it on graham crackers. I bet that cheesecake dip tastes amazing! What a novel idea to mix cream cheese with cake mix. I will have to try this. Wow! This sounds amazing! My husband LOVES funfetti and cheesecake so I’m sure he would drool over this! This cheesecake dip looks delicious. A different spin on a great dessert. This is such a creatve idea, never heard of a cheesecake dip before. I totally pinning this for later. I am totally borrowing this you know. It’s such a fun dessert. I usually make boring old cookies or brownies.